When I graduated from Angelo State University many decades ago, I had a chance to go Italy with many of my fellow art majors. Having excelled in the study of the Italian Renaissance, such a trip greatly appealed to me. Alas, I was poor. At night I worked at a bakery while going to school full time. I had rent and bills to pay and I didn’t have any savings for such a vacation. The head of the fine art department, Dr. Otis Lumpkin, offered me some financial aid. He was a great professor, but I had a new job awaiting me at the local newspaper. It was a chance to work at a desk while doing something I enjoyed—graphic arts--and I didn’t want to put that off. I figured I could always go to Europe later on my own time and dime. It never happened for various reasons. Now I’m not sure I would like what I see if I do finally make the trip. Will Europe be recognizable if Islam continues to gain power there? “No go” zones continue to expand while those who complain are arrested for ‘hate speech.’ The complainers are labeled ‘Islamophobic,’ ‘xenophobic’ or ‘populists.' Oh no! Populism and nationalism are supposed to be terrible things according to the left. We’re supposed to love everyone and have open borders. We’re all the same, right? Wrong. People and cultures are different. Too much diversity inevitably leads to conflict. Ostensibly the ‘immigrants’ were brought into Europe to boost the economy and do the work that the citizens wouldn’t do. (Sound familiar?) Instead, they were put on the dole. They got free stuff while out-breeding the locals. They brought their lower IQs and aggressive religion with them. Far too many refuse to assimilate. Why should they? Islam tells them that they are superior. Today, Mohammed is one of the top names for newborn boys. Sharia courts are springing up unopposed. Western civilization is treated with disdain. Women are raped and the police look the other way due to political correctness. Why are we seeing this self-immolation by the west? Because lefty loons and George Soros want it. 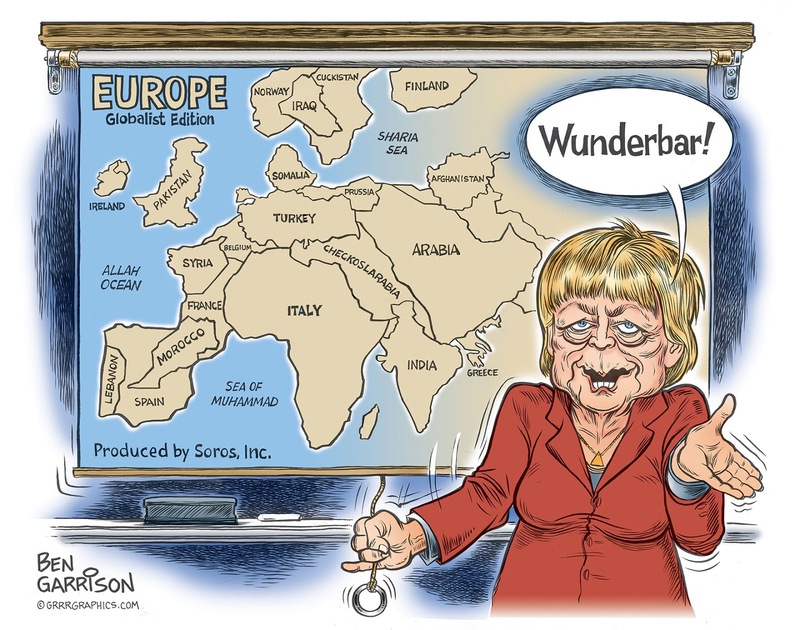 They want to tear down western civilization in order to easily usher in globalism to Europe and America. We are beginning to see some push back. The Brexit vote and the election of Trump signaled that citizens have had enough, but there is much more to be done. Soros needs to be arrested. Merkel needs to be thrown out of office. Mass immigration needs to end. I want the countries in Europe to keep their identities, languages and cultures. I don’t want to visit Turkey in Germany, Somalia in Italy or Syria in France. If I wanted to go to Saudi Arabia, I would. I don’t want to see their oppression when I go to Europe. If we want to help the populace of the third world, fine. But keep them in their own countries while doing it. We don’t need to import them and their problems to the west.